GROZNY, Chechnya – At the recent routine meeting between Ramzan Kadyrov and Vladimir Putin on March 20, the Russian Prime Minister expressed an interest in the republic’s economic situation. 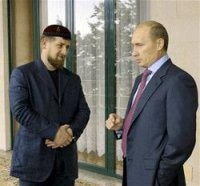 Kadyrov reported that that everything was in order: the economic crisis was affecting Chechnya less than other regions of Russia, and problems such as unemployment and the aftermath of earthquakes were being dealt with more quickly there. Scenes like this give the public not the slightest idea of the truly critical phenomena which are accumulating in the relationship between the federal centre and the Russian regions. Meanwhile, few are aware that Kadyrov has to make Herculean efforts in order to extract essential funding from the Ministry of Finance. For example, earlier this month the Caucasian Knot website reported the temporary closure of several factories in Chechnya and the suspension of construction work in several places, due to a lack of finance. In particular, the construction of 300 cottage apartments in Grozny’s Leninsky district has been halted. Argun’s VAZ automobile production plant and Grozny’s Elektropult and Transmash works, as well as a cardboard factory, are all standing idle because they have insufficient working capital. There is not much point in trying to describe the whole range of problems – they are generally the same as in the other Russian regions. However, Chechens will have far less right and opportunity than the citizens of Russia as a whole to express their discontent. R. A. Kadyrov: Yes. We are on excellent terms with the Ministry of Finance now. R. A. Kadyrov: Friendship, thanks to you, Vladimir Vladimirovich! Why are issues that ought to be addressed as a matter of course dealt with only after they have drawn the Prime Minister’s attention? To neither of the interlocutors does this situation seem abnormal. They are entirely happy with each other. V. V. Putin: Good. Let’s talk about details now. How is this mosque of yours functioning? I saw that large-scale events have already been held there. R. A. Kadyrov: Thanks to you, we have built the mosque and can perform religious activities there. The people understand this, and they are grateful to you. We celebrated the Prophet's Birthday. We did so beautifully. [...] Thanks to you, we have built a mosque in honour of our first President. V. V. Putin: So it’s all functioning? R. A. Kadyrov: Yes, indeed. My words of thanks.